Gardening is so relaxing. Just looking at beautiful greenery and flowers is calming to my soul. The southeastern corner of Connecticut is less populated than the western and central parts of the State. We have a lot of open areas and State Parks, State Forests and Preserves. Wandering through these areas, or hiking, you find little nooks and crannies of wildflowers. Every so often one will sprout up in my planted flower beds and most of the time I leave them alone. 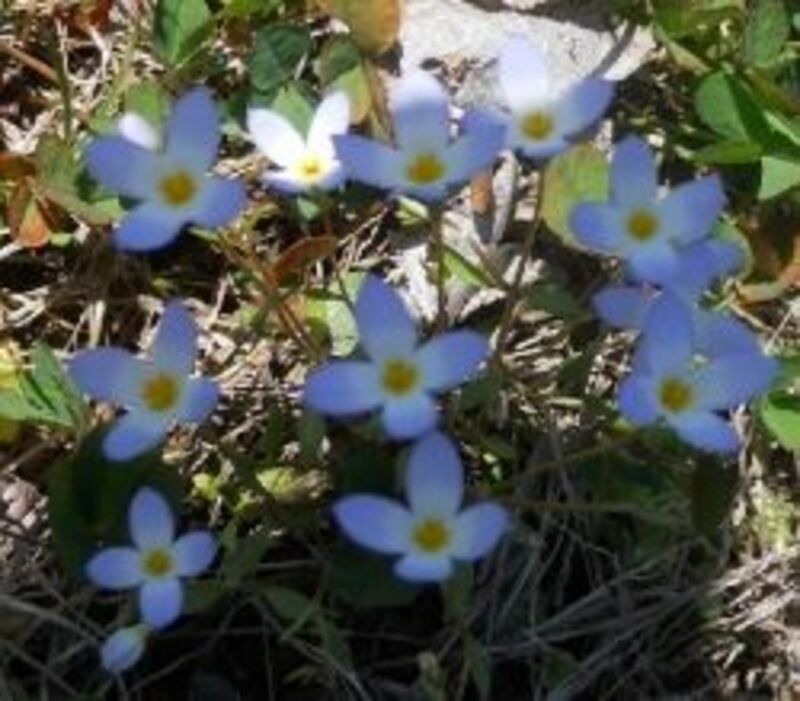 We are going to explore the most common flowers in Southeastern Connecticut. How do You Feel About Wildflowers? As I mentioned, from time to time, I find wildflowers in my flower beds. I try to leave most of them alone. Once in a while, I will weed them out if they are going to grow huge and are glaringly in the wrong place. They are part of nature. I noticed one particular wildflower is particularly attractive to honey bees. Even though the plant itself is not great looking, I leave it to help the bees. There are also certain wildflowers that different species of butterflies are dependent on to reproduce. This is one of those folk remedies that is really supposed to work. 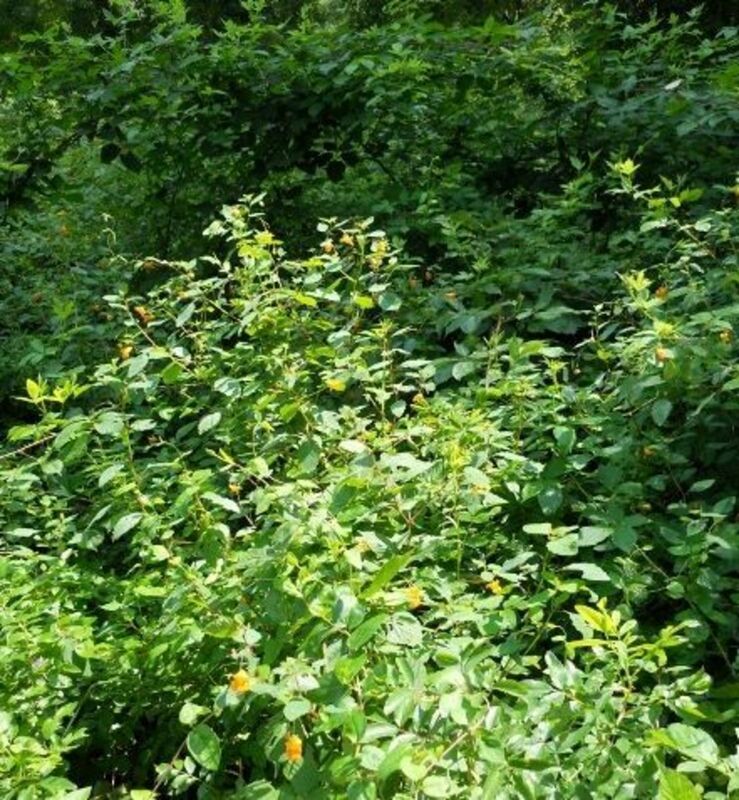 If you are exposed to poison ivy, squeeze the juice of the jewel weed flower on it immediately to stop the rash. (Often, they grow in the same place or nearby). This photo was taken on a hike at Bluff Point, Groton, CT . These also grow all over the uncultivated areas of our backyard. They start to bloom in early August. These are found in open fields and along roadsides. As a child I loved the color of these flowers and wanted to have bouquets of them in vases. I tried every child-like experiment I could think of to make them last. Alas, these will only last a few hours, if that, in a vase. The curly leafed chicory or Belgian endive is we use in salads is a distant cultivated relative. It has a similar blue flower. The root of the cultivated plant, is the one that is dried, roasted, ground and added to coffee to give it a more mellow flavor. 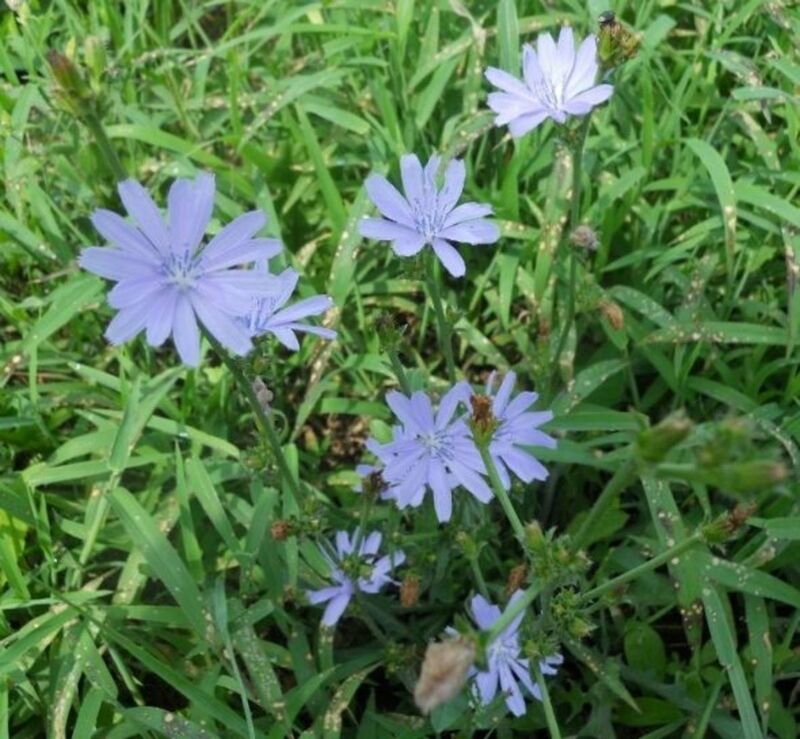 During WWII chicory was widely used as there was a shortage of coffee. See Coffee and Chicory for more information. These grow primarily where you see low shrub growth and in fields. True to its name, it attracts butterfles. When honeysuckle are in bloom, you know it. The fragrance is incredible. I hope everyone has an opportunity to smell them sometime. 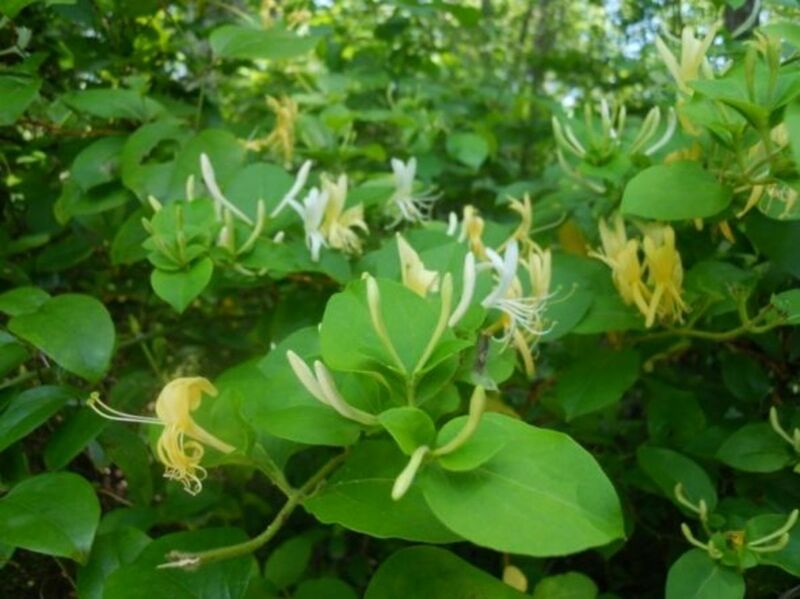 Honeysuckle grows as a vine. I like to take springs of honeysuckle and put them in small glass vases (or just glasses) around the house. As you walk around the house you get the uplifting smell of honeysuckle. Makes your day. Honeysuckle bloom around mid-June in Southeastern Connecticut. 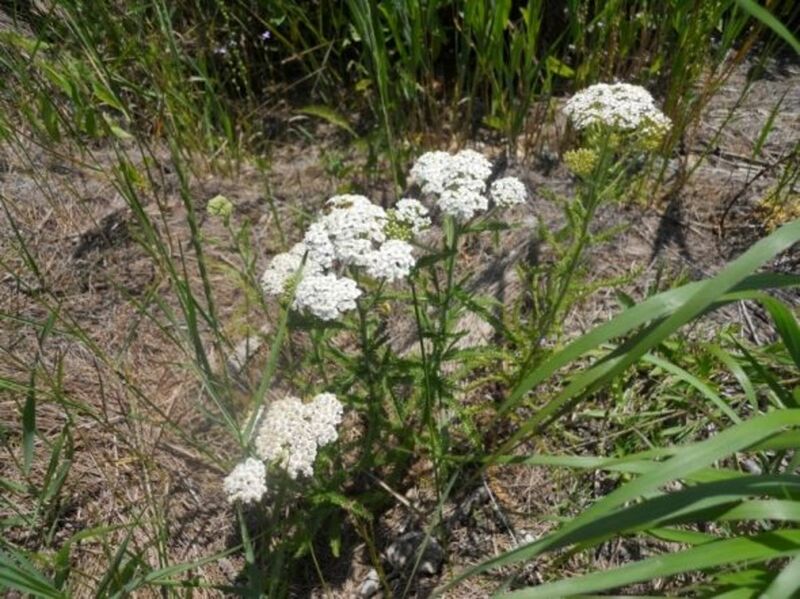 Yarrow is pretty common in Connecticut. 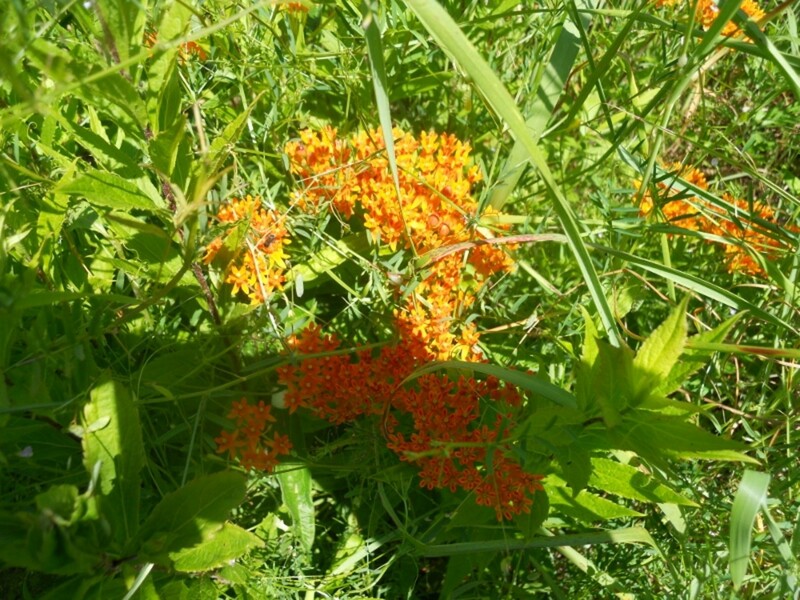 It grows on the side of the road and in open fields in the summer. It is a lot denser and sturdier than Queen Anne's Lace. It grows about 18 inches high. Yarrow is super easy to dry. Just make a bouquet of them and tie together with a twist tie and hang upside down in a dry place. They are hung upside down so the stem dry in a straight position. If you dried them in a vase, the stems might collapse. You can use them as is, in their white color, or spray paint them lightly in soft pastel colors -- or what ever color of your choice. 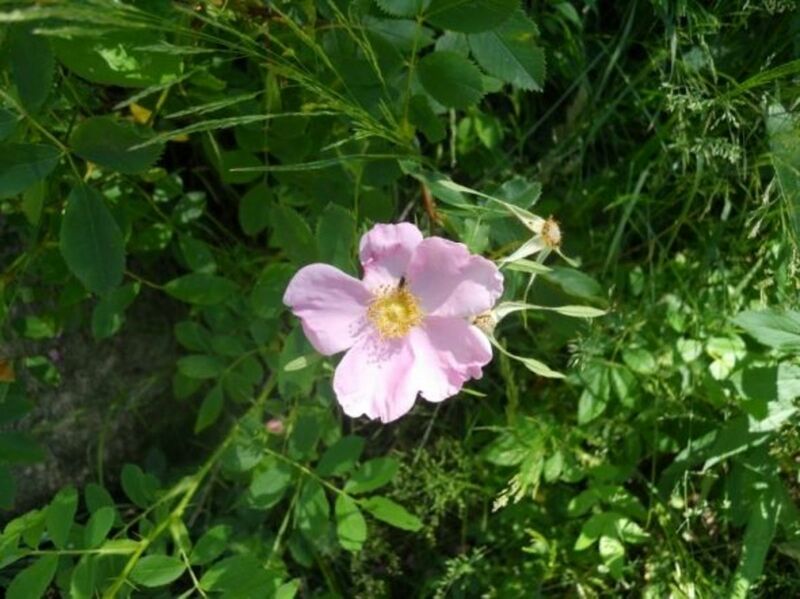 This type of rose is found mostly in sandy soil along our beachs and coast line. It does grow pretty well elsewhere. 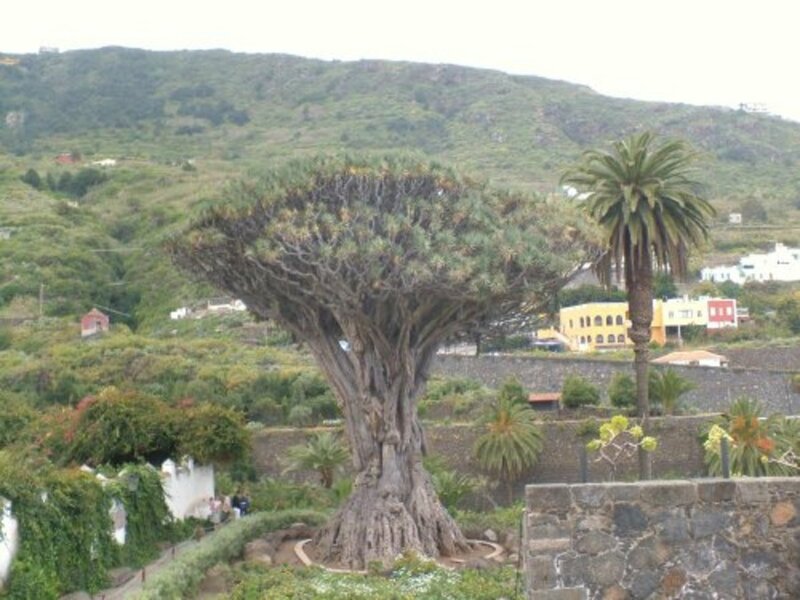 It's a thorny medium size shrub. I believe this is a Virginia Rose (Rosa virginiana). 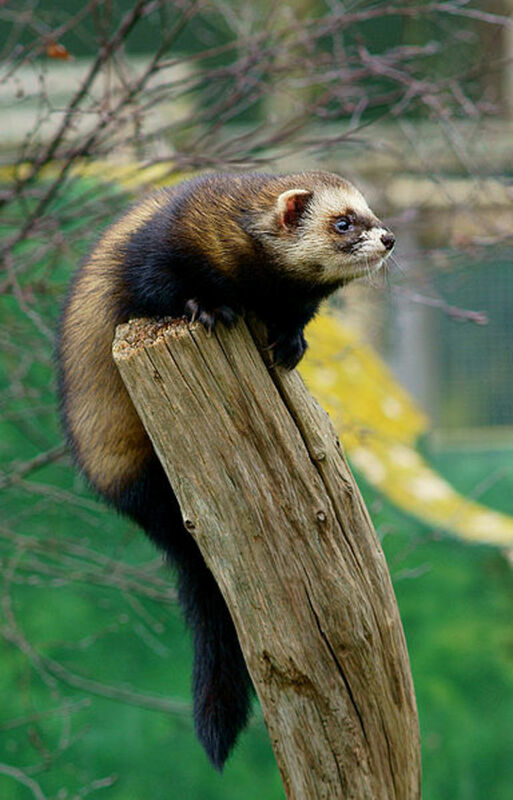 Despite, it's name, it is native to Connecticut. This picture was taken in my backyard. Birds must have dropped the seed in my flower bed. One of my all time favorites. 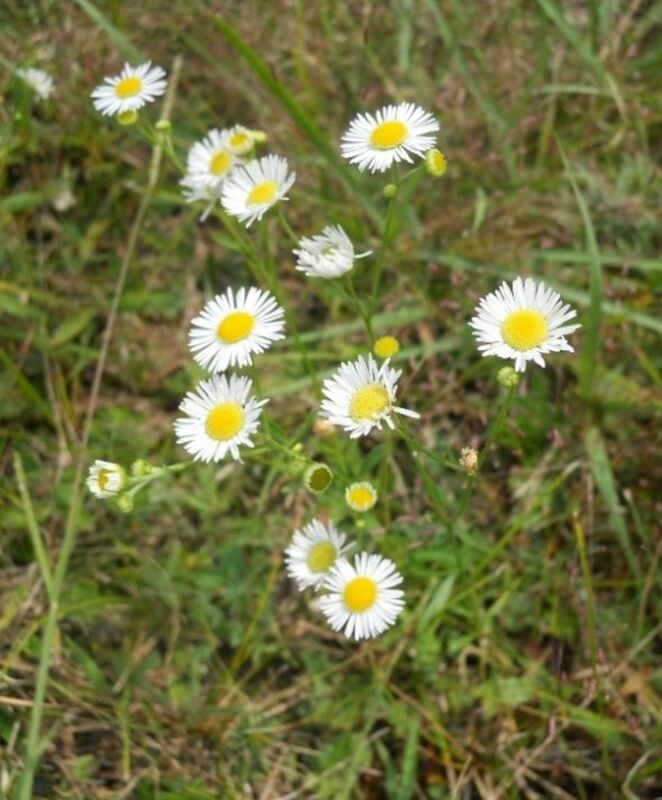 These grow in open fields and along roadsides in the summer. This year (2012) they seem to be especially prolific and we have large swatches of bright color. They grow from 18 inches to over 2 feet and are on relatively strong stems. Surprisingly, I found they don't last very long if cut and put in a vase. They last about 2 days. This is a picture of violets growing in our lawn. They bloom in the early spring. 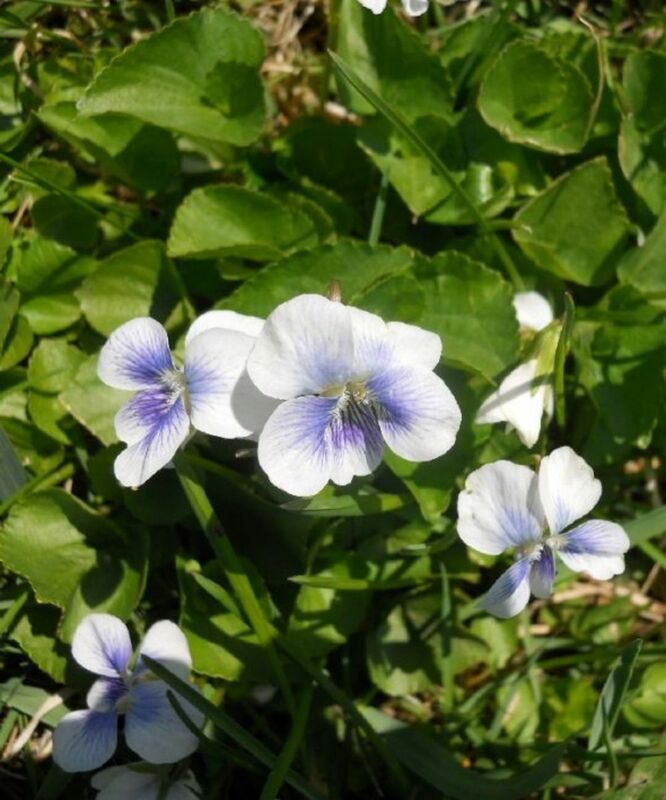 Some years there are little clumps of white violets mixed in. This year, when I took this photo, I couldn't find any white ones. 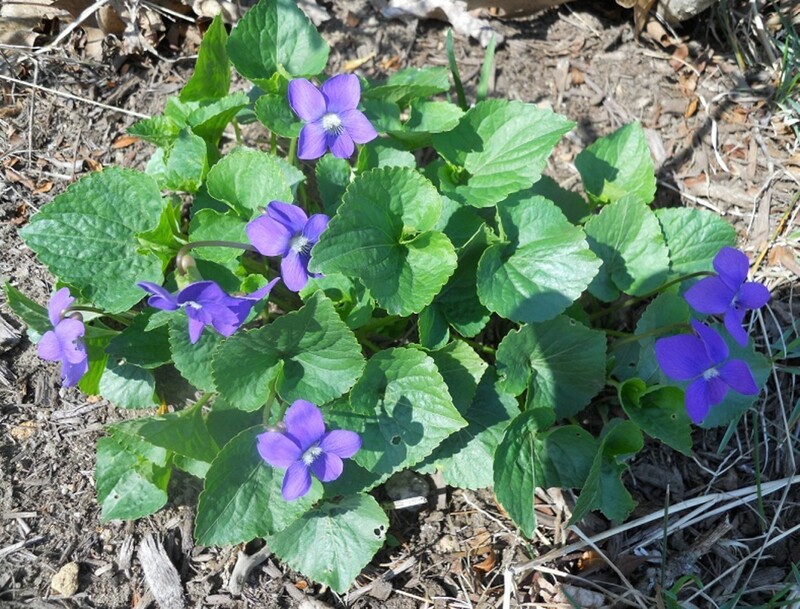 Although we tend to see more purple violets in Southeastern Connecticut, there was quite a large patch of these outside the library in Voluntown on April 28, 2013. I photographed these looking down on them, but they grow 18" to 3 feet tall. All of them have that little black center -- it's not a bug -- that is how you distinguish them from similar looking flowers. Similar looking flowers are cow parsnip and water hemlock. You will find Queen Anne's Lace anywhere there is an open space -- even just a small patch of dirt. Queen Anne's Lace will keep for a few days if cut and put in a vase. They do drop off little pieces of their petals but they still retain a lacey look with dropped petals. I like to mix they with garden flowers in a bouquet as they soften up of the look much the same way as baby's breath. These are so common that they are great for craft projects with children. I pressed one years ago and still have it. See my web page Inexpensve Wall Decorations. 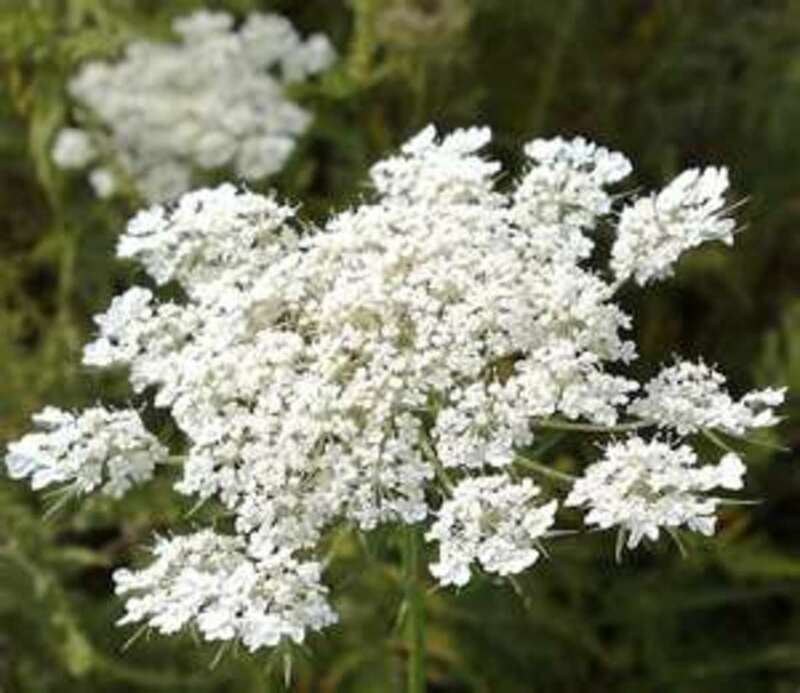 Another fun project for kids is to dye the Queen Anne's Lace. Fill a container (paper cup, glass jar, etc) 1/2 way up with water. Add several drops of food coloring --make the water pretty dark. Insert the Queen Anne's Lace. In an hour or so you will have colored Queen Anne's Lace. Check out OhMe's page Queen Anne's Lace for instructions on how to do this. Joe Pie Weed - A sturdy looking plant with a nice mauve color. This is an interesting plant. It grows in meadows, but more so if it's just a little marshy. I have seen it on the side of the road where there is a drainage ditch. It is 12 to 24 inches tall. 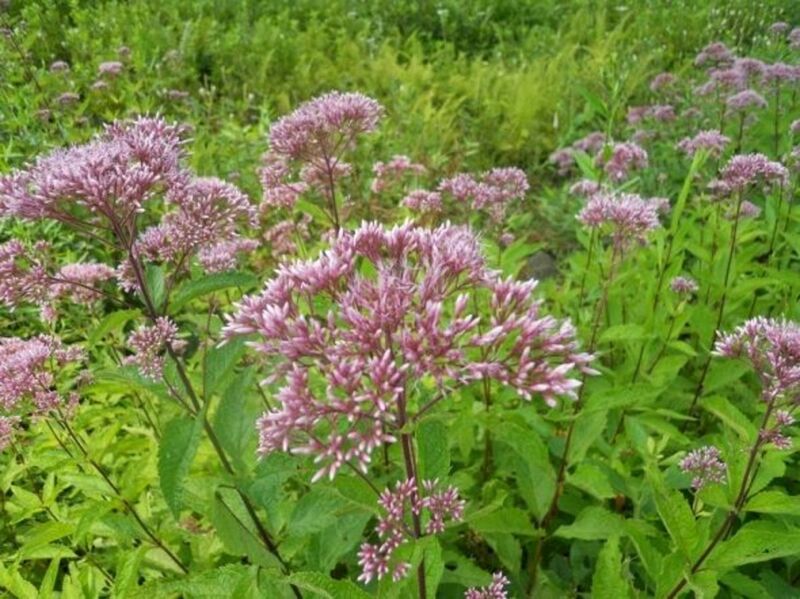 With the increasing popularity of planting butterfly gardens, Joe Pie Weed is now sold in garden centers as it attracts butterflies. 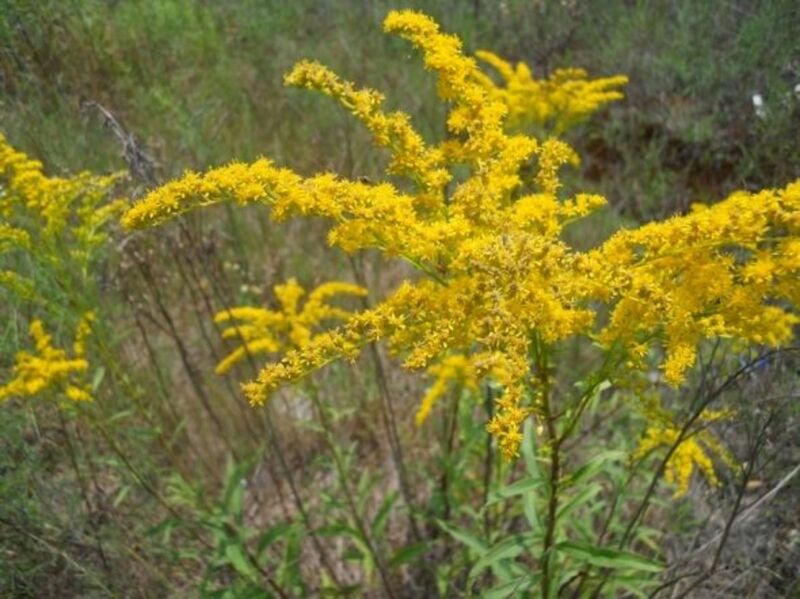 Goldenrod - Are you allergic? So many people are allergic to this plant. For sure, these people keep it out of their gardens. It is hard to avoid as it pretty much growns anywhere there is an open field. I often use these in flower arrangements. I am not allergic, so it's not a problem. When company comes, I remove them, just in case someone is allergic. These stand 18 inches to 3 feet tall. These wild asters grow all over, in dry open fields. There are also quite a few similar varieties. The Heath Aster has a larger center than some of the other varieties. Blooms from April to July. Flower is about 1/2 inch across. 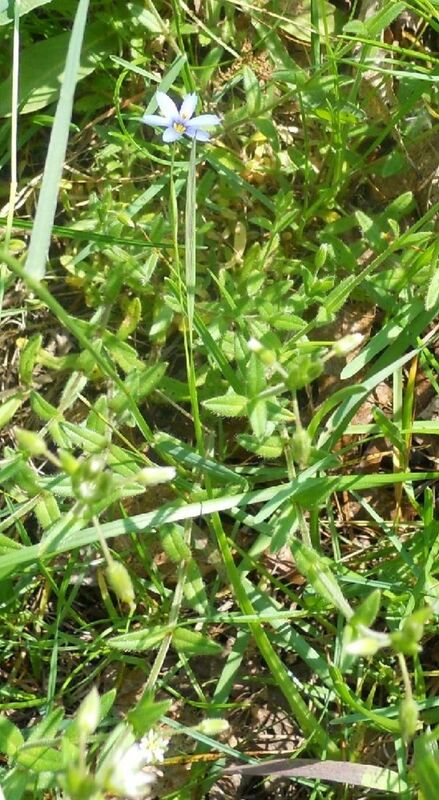 These were about 2 inches tall and were found co-mingled with white clover plants. Most of the green visible is the clover. 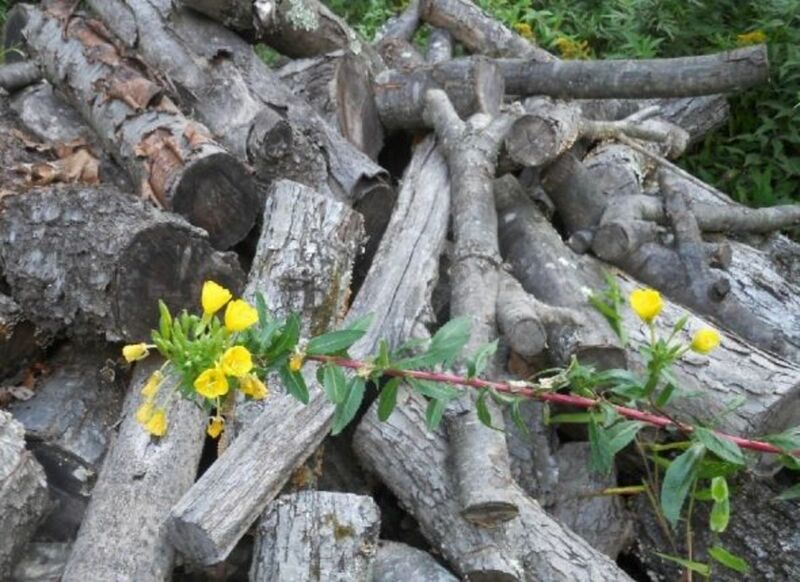 I wasn't going to include the Evening Primrose as it is tall and stalky. The flowers tend to be closed in sunlight and open more toward evening. So it looks more stem than flower most of the time. The other day, I saw a hummingbird feeding on an evening primrose and I realized their importance. This late in the season, hummingbirds are going to start their migration south and need all the nourishment they can get. I believe this to be Mountain Blue Eyed Grass as all of the flowers in this patch were single flowers on a slender stem. The Eastern Blue Eyed grass can have multiple flowers at the end of one stem. The Stout Blue Eyed grass has a thickening of the stem near the flower. Is found throughout the United States. This photo was taken in Groton, Connecticut in late July. However, the plant may bloom between May and September. 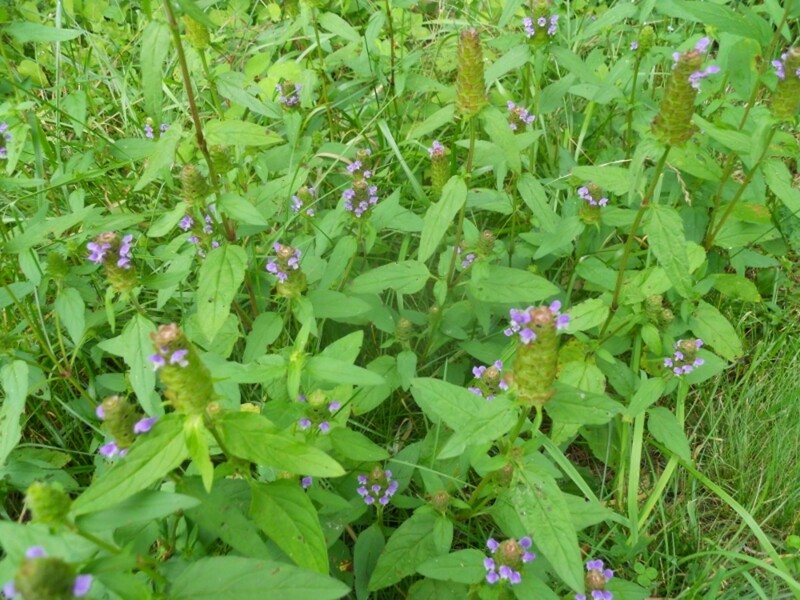 It grows in shady moist areas, at the edge of forests. It's about 1 - 2 feet tall. It was traditionally used in natural medicine as a throat remedy. Leave your message. I love hearing from visitors. Wildflowers attract so much wildlife, pity we don't make more space for them in our gardens! Nicely done! I really loved the chicory photo. @LaurenIM: Actually, I could. In the spring when then bloom, I could send you some dried ones. The seeds could be planted. Re your violet picture at the top of the page: That's my favorite flower but they are not prevalent where I am so it's frustrating! Can you send me some? lol! @favored: Some of these have now been cultivated for home gardens. The cultivated yarrow comes in colors. Our nurseries sell Joe Pie Weed for butterfly gardens. 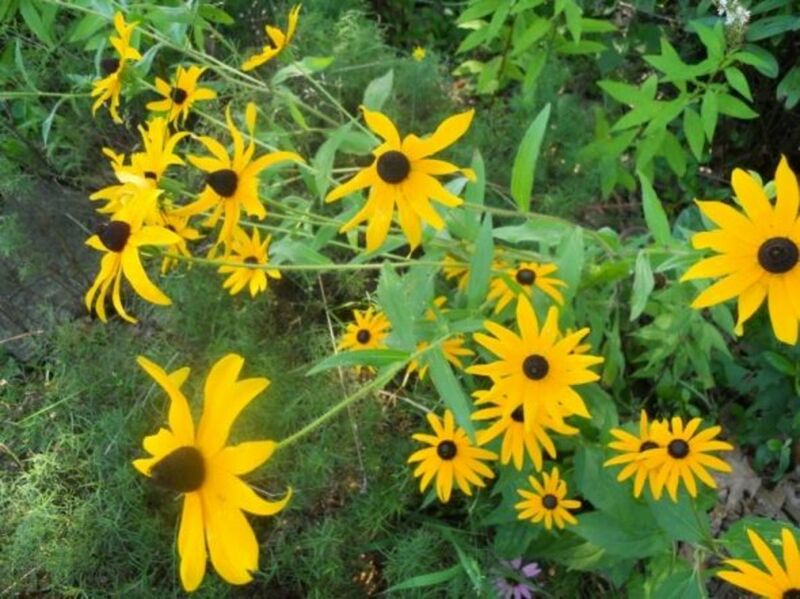 Black eyed Susans also come cultivated. The Common Yarrow looks different there, but it's still pretty. I didn't know some of these were wildflowers. Very nice lens, thumbs up! I'm a big fan of wildflowers and love photographing them. Your page is great! Great lens - thank you. Just love honeysuckle. We just have a wild garden in our cottage and every year is a surprise. Great wildflower photos! Blessed by a Squid Angel! I Love this lens. The flowers are really pretty. Great subject for a lens! Very well-done. Nice pictures. Thanks for sharing! Your photos are gorgeous, nice lens. I love this lens. the photos are really beautiful. I love wild flowers. I go walking with a group each week and they think I'm odd when I stop every few minutes to take photos of the flowers. Black Eyed Susan doesn't grow as a wild flower in the UK, or at least not that I've ever seen. They're very beautiful! Good work for the study and thanks to sharing with all of us. Great photos - lovely lens. Very nice lens, I loved seeing the beautiful photos. Angel Blessed! I liked learning the names of these flowers. Thanks for the lesson! Have a nice day. Popping in to sprinkle some angel dust on these lovely flowers. E have ask of these where I live in the midwest too. I love them all. 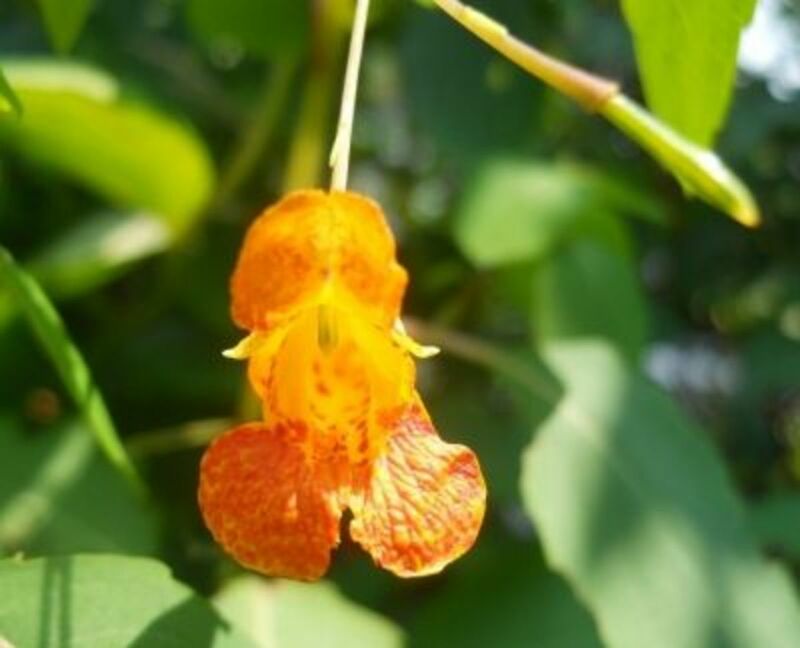 I was just taking pictures of the jewelweed blooming the other day. Beautiful photos! I love wildflowers. Beautiful pictures. These all look so gorgeous. Beautiful lens. I grew up in the Northeast, and love these beautiful wildflowers. They make me feel so at home. Thank you for this beautiful lens. Lovely photos. We had goldenrod at our family home in the U.K. Mum grew it like a cultivated flower. She had a big clump of them. I'm surprised to see so many plants I'm familiar with growing in Southeastern Connecticut, they must have been moved around by people I would guess. Jewel Weed does relieve poison ivy symptoms quite nicely, my Dad used it over 30 years ago but I'm not sure how he knew about it. Your pictures are wonderful for that close up feel, everything except the smell! I grew up in SW PA, and we have a similar enough climate that these flowers grow in my home area. Now that I live in Florida, it's one of the things I miss the most and enjoy seeing any chance I get. Thanks for sharing! Enjoyed your flowers. Thanks for sharing them. We have a few of them in Florida too. Connecticut has some beautiful flowers. Noticed a few that we enjoy here also. So many pretty and useful wildflowers! Very interesting. Living near you in central CT, your photos are like tour through my gardens! This takes me back to when I was a child and was so excited to bring my mom a lovely bouquet of wildflowers. Thank you for the nice memories and photos. Oh I sure enjoyed seeing your wildflowers. So beautiful. 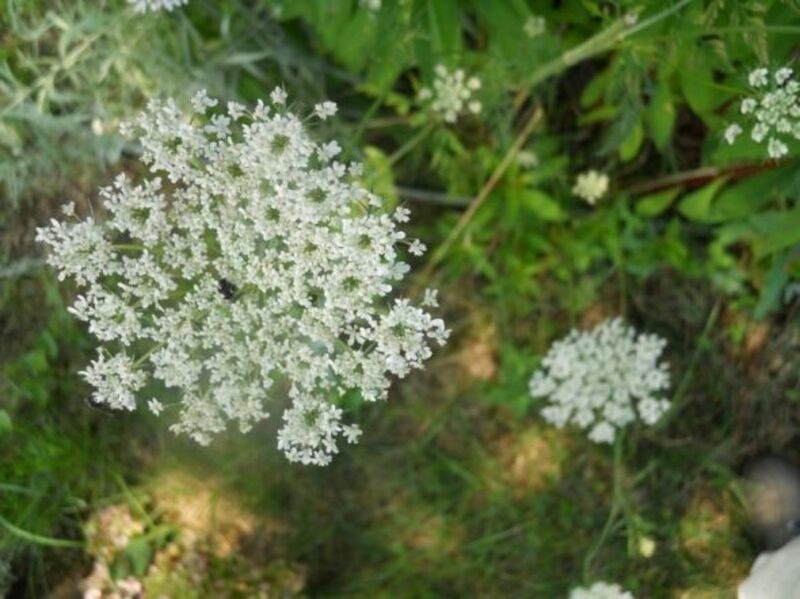 Your photos are great and thank you so much for sharing the link to my Queen Anne's Lace. That is a super photo you took. We had honeysuckle growing over our porch when I was growing up. The smell reminds me of childhood. 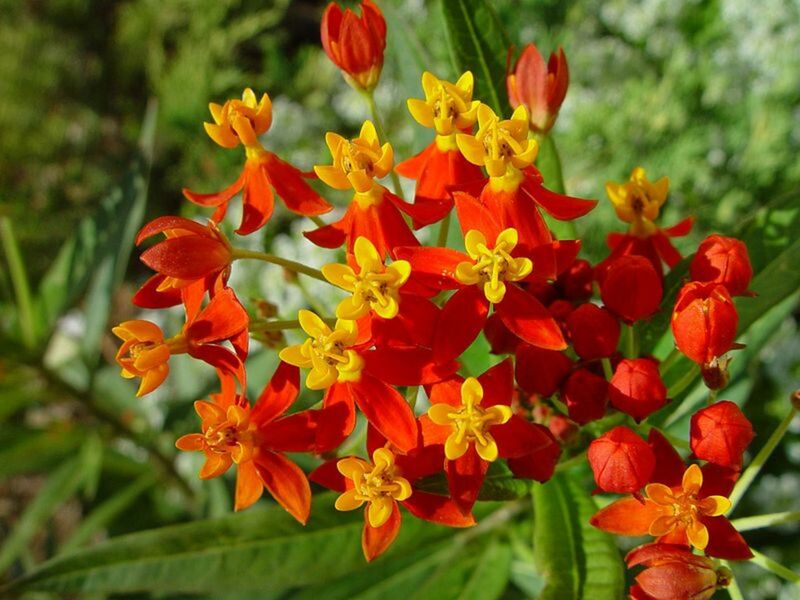 So lovely - especially the butterfly weed! Thanks for sharing!